If you've known anyone who has worn braces, you know what comes after — wearing a retainer. This can be kind of a letdown after all those months with braces, but it's absolutely necessary. That's because teeth have a tendency to “rebound” to their pre-orthodontic positions once the force to move them stops after the braces are removed. Retainers help keep or “retain” moved teeth in their new positions and prevent them from reverting to the old. When you think “retainer,” you probably picture a removable appliance with a wire that fits over the front of the teeth. While that may be the most common type, it isn't the only one. There's another called a bonded retainer, a thin piece of wire bonded to the back of the teeth that need to be retained. Unlike the other type, a dentist must remove a bonded retainer when it's no longer needed. 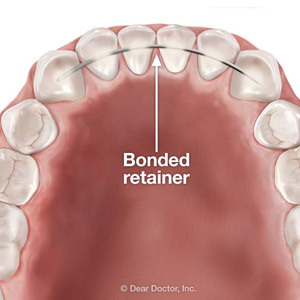 The biggest advantage of a bonded retainer is its invisibility — the wire is behind the teeth so no one can see it as with a removable retainer. The wire is bonded to the teeth with a dental composite material and then light-cured to create a strong attachment. Another advantage is especially pertinent to younger patients. Because it's permanently attached and can't be taken out, there's no constant reminding of the patient to wear it — and no more worries about replacing a lost one. They can, though, be difficult to floss around leading to potential plaque buildup that increases disease risk. It's very important you receive proper hygiene instruction for cleaning under the bonded retainer. Another concern is that they can break under excessive chewing pressure. And as with the more common retainer, we wouldn't want to remove it as that will result in the teeth's relapse to their old positions. To learn which retainer is best for your situation, you should discuss the options with your orthodontist. Regardless of which type you choose, though, a retainer is a must for protecting your investment in that new smile.